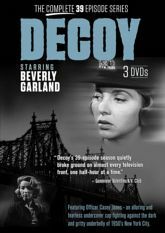 Based on a variety of factual cases tackling controversial subjects, the Decoy series was a significant marker in television history, undeniably ahead of its time. Initially broadcast in 1957, it was the first show to film on location in New York City�and the first to feature a policewoman as its main character. The talented and stunning Beverly Garland steals the show as the no-nonsense and uncompromising female crime fighter, Casey Jones, sharing the screen with a variety of up-and-coming talents such as Peter Falk, Larry Hagman, Martin Balsam, and Suzanne Pleshette. Casey Jones narrates and, at the end of every episode, breaks the fourth wall to speak directly to the audience, often sharing how the case affected her. She does not have a regular partner and is assigned to a different department every week - whether in uniform, undercover, or as the officer in charge.